Tumi Gusseted Card Case. Tumi logo detailing. Tumi ID Lock™ is a proprietary technology incorporated into the design of this product that protects personal data encoded on most IDs, credit cards and passports. Made from soft, full-grain napa leather, Delta designs feature interiors with red stitch detailing, a ballistic nylon spine and easy-access card pockets. This gusseted card case ID features a gusseted card pocket, card slots and an ID window. Model: 0118256MLID. Style: Gusseted Card Case W/ID. Taking you from work to weekend, the Chambers collection of wallets and accessories is handcrafted from supple and smooth goatskin. The interior of each piece is distinguished by a subtle, contrast edging detail. Tumi 11882IND. Model Number: 11882IND. Original Tumi Luggage. Camden Leather Passport Case. Line Camden. INDIGO BLUE Color. 2 slip pockets. 7 card pockets. Tumi Handbag with ID Lock. Tumi Alpha Multiwindow Card Case. Tumi logo detailing. Tumi ID Lock™ is a proprietary technology incorporated into the design of this product that protects personal data encoded on most IDs, credit cards and passports. T-Tech by Tumi. Rich black leather is highlighted and contrasted by navy wax cotton accents in this T-Tech by Tumi collection of wallets and card cases. Black Leather. This card case has four card slots plus a double hidden pocket for receipts. 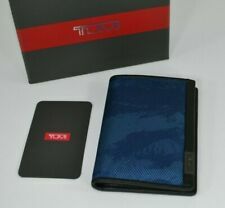 Tumi Alpha Slim Card Case. Tumi logo detailing. Tumi ID Lock™ is a proprietary technology incorporated into the design of this product that protects personal data encoded on most IDs, credit cards and passports. Tumi Chambers Gusseted Card Case. Tumi logo detailing. Tumi ID Lock™ is a proprietary technology incorporated into the design of this product that protects personal data encoded on most IDs, credit cards and passports. 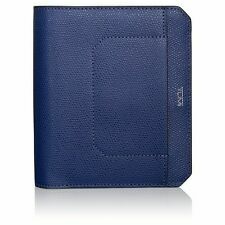 Navy Deep Blue leather, slim multi window card case by tumi. Pockets with red lining blocks RFID signals and protects your card info. Let me know if you have any questions. Sold as-is, sorry no returns. Slim textured card case finished with logo accent. Five exterior card pockets. One exterior slip pocket. One exterior zip pocket. Sorry,we don't have original box.